We had chosen to stop over in Kazan to break up the long journey and to see the world-heritage listed Kremlin. 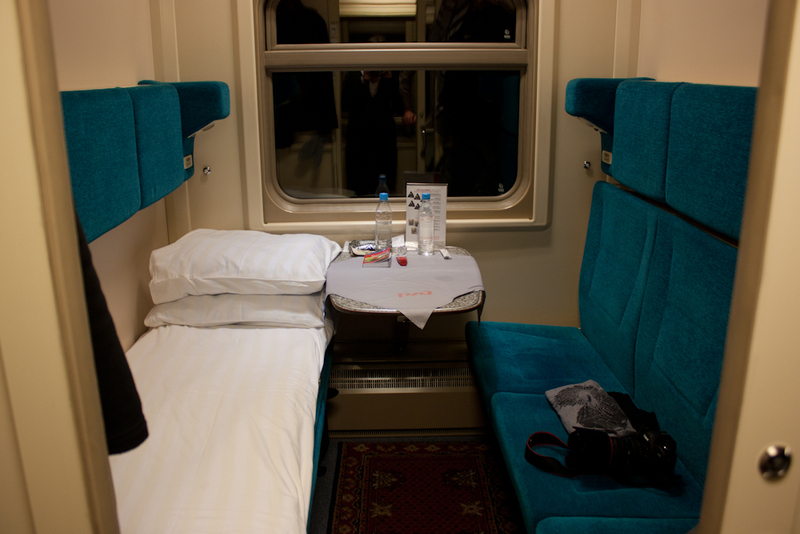 At the end of our three-night train trip, we were glad to have made this choice, as another 12 hours on the train to Moscow probably would have been too much for us to endure. After arriving we spent the afternoon recovering and had dinner in our hotel, which turned out to be a pretty strange and amusing place. Inside the hotel – one of the tallest buildings in the city – was a bowling alley, bar, billiards area and a huge empty restaurant over two floors. The all-Russian menu had photos to help us make our choice, which would have been handy if we could have deciphered what the different meats were in each picture. I selected something that looked like chicken, which turned out to be pork, while Richard selected something that looked like steak. They could have served us anything and we probably would have been happy as these were our first decent meals in four days. The next morning over breakfast we were entertained by the nightclub atmosphere, and enjoyed our Russian style breakfast listening to the blaring tunes of ‘From Russia with Love’ and other 90s anthems. Our room had a fantastic view over the city and the Kremlin, which at night was lit up beautifully. The following morning we ventured out to check out the Kremlin and the city, which were both impressive, but strangely quiet. There were a few tourists in the Kremlin and we found people wandering around the main street of the city but other than that the whole place had a slightly empty feel about it. The city contained plenty of beautiful old buildings many with a Tatar influence, but it also seemed to have its fair share of abandoned and dilapidated buildings too. In the main streets these were covered with a fabric printed with outlines of windows and other features presumably reflecting what the building would have looked like – an interesting and surprisingly effective solution to the presence of such structures in the main thoroughfare. One day was probably enough for us in the city and we were happy to head to the train station that night. 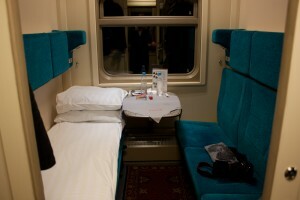 Train 1 to Moscow certainly lived up to its namesake. We were overjoyed when we realised we were once again in a first-class style carriage with a clean and near-new compartment to ourselves. The friendly provodnitsas served us tea before we fell asleep on the relatively comfortable beds.